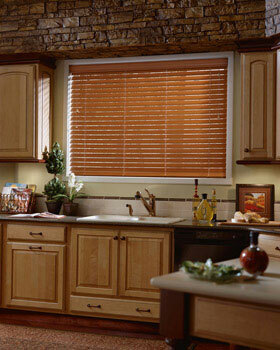 Blinds come into their own in the kitchen, because they are much more practical to use at windows than curtains. Laminated blinds are excellent, because they are so easy to keep clean. Venetian blinds are good for stuffy kitchens or those where you want to obscure the view, but they are more of a chore to keep clean than plain roller blinds. Use blinds to pull down in front of a row of shelves, or to hide wall cupboards above a working surface. This is a particularly handy disguise in an open house or a combined kitchen/dining room. If the blinds are made to pull down just to the level of the flat surface, they will hide any unsightly mess left there from other parts of the room. You could also use a long floor-to-ceiling blind to screen off a laundry area in the same way as for the washing arrangements to a bedsitter described above. You can keep washday gear on fitted shelves above the washing machine. If the back door is glazed, use a blind. A light roller blind can be attached to the top of the door itself, so it won’t get in the way if the door is opened when the blind is pulled down. Again, a blind is often the best answer for a window covering in a bathroom, particularly if you choose a laminated fabric, because it won’t go limp in the steamy atmosphere. If you want to divide up the room, try a tall narrow Venetian blind to make a screen between the bath and lavatory. You could even use pvc roller blinds instead of shower curtains beside the bath. When the shower is in use, the blind is pulled down inside the bath to keep the splashes in. The kitchen is equipped with a small sink, fridge and boiling ring, making an ideal place for serving drinks, brewing coffee or heating snacks. One remaining wall has glass windows, and the other is covered with mirrors. At night, kinetic lights reflect off the white ceiling. In contrast to the striking appearance of the garden room, is the open plan kitchen – dayroom. The large stainless steel bar, echoed by the roomy bottle rack above, divides the cooking area from the eating and sitting area. A number of useful items have been built into the stainless steel counter top -two bowls for washing up, a circular pastry slab of marble, and an electric cooking hob. The raised oven and fridge have been fitted into a storage wall fitted with cupboards and drawers, finished with a red laminated surface. This kitchen unit is a superb example of the benefits of a well-planned layout. Although it is contained in a small space, the kitchen is efficient, easy to work in, and visually appealing. It is wise not to let a kitchen ‘evolve’ in a haphazard fashion-a great deal of thought should be given to the arrangement of storage units and appliances, ventilation, and plumbing. The step down to the main part of the room is effectively set off by the touch of red laminated skirting. The centre of the room is used for family meals and as a play area for the children. The pattern floor is a time-saver when it comes to house keeping. The dining room is yet another splash of colour with walls painted in a gloss paint. Instead of curtains, there are floor-to-ceiling ‘shutters, also painted in gloss paint, giving the room an almost grotto-like effect. Although the room is not a particularly large one, the choice of furniture gives a sense of spaciousness. The glass-topped table is on a stainless steel base. The transparent perspex chairs are visually unusual and also very practical because of their washable surfaces. The red-fronted cupboards are useful for serving and have the added attraction of inset stainless steel hot plates for keeping food warm. If a house needs cheering up or you want to get a new look without spending a great deal of money, think carefully about changing the colour scheme. We cover South Kensington and Chelsea. Showers, bathrooms, kitchens, tiling,renovations, refurbishments. As well as a cheerful colour scheme and wisely chosen lighting, you should look for accessories like tiles for worktops or floor, storage jars and pretty pots and pans which will add brightness to your kitchen. However, you must remember that while a plain flooring in a pale colour like white or yellow may reflect extra light, it will need a lot of cleaning if it is not to look tatty. Instead of a dark flooring, however, go for an attractively patterned sheet vinyl, which will look bright but not show every speck of dirt. One of the best ways of lighting a low kitchen is to fit downlighters into the ceiling. They don’t encroach on the headroom, but are particularly efficient if they are placed strategically above worktops, cooker and sink. Another way of letting in more light is to fit a larger than average serving hatch, thus borrowing light from the adjoining room. In a kitchen, gloss-painted walls combine extra reflected brightness with ease of cleaning. Oddly enough, one of the best ways of dealing with a dark bathroom or lavatory is to decorate it in deep vibrant colours. These will help to make the room seem warmer, and when combined with plenty of strong lighting it will become much brighter. Since you are often scantily clad when you are in the bathroom, it is important that it is a cosy room, so try to avoid the traditional pastel shades of pink, blue and green if your bathroom tends to be cold. Here a deep chocolate brown with bright towels and blind will create a more inviting feeling. Lavatory windows usually have frosted glass in them, so the view out is not important. A permanently-closed blind which matches the wallpaper will give a warmer feel, and a bright, low light hanging from a dark painted ceiling will minimize the lofty feeling of a very tall room. You can achieve an unusual effect very cheaply by papering the walls of a lavatory or bathroom with wallpapers. Paint one or two coats of clear wallpaper lacquer on top to give a washable surface, and you have a bright black and white room. Obscured glass sometimes keeps out more daylight than net curtains, so check whether you really need frosted glass in your bathroom and lavatory windows. If you are overlooked, you may find that only the lower part of the window needs to be obscured, and that the top can be fitted with clear glass. Don’t resign yourself to having dark, dreary rooms. Use the ideas given here to transform the dull parts of your house into bright, welcoming rooms. If you are tiling the walls, remember that most floors are slightly out of level. So use a lath or batten as a base line because if you start from the floor or skirting board, you may find the tiles go out of true. First measure the height of a tile, including its spacer lugs, from the floor or skirting board. Fix the top of the lath or batten securely along this line to the length of the area being tiled. Check its accuracy with a spirit level. Take one tile, stand it on end, and run it along the floor beside the batten to make sure the batten is not too high-you do not want to fit tiny silvers of tile at the bottom if the floor is uneven. If the batten is too high, lower it, and then re-level it with the spirit level. Next, mark out tile widths on either side of the centre point of the wall. This will give an equal tile cut at the ends, and should avoid having to make very short awkward cuts. Mark a true vertical line at the end of the wall, corresponding with the outer edge of the last full tile space. Now repeat the procedure on any walls which meet the first one. But this time, if the wall length does not match an even number of tiles, try to space them to avoid finishing with two very narrow pieces in the same corner. And see if you can have complete tiles on either side of window reveals as it will save cutting. You start work at the intersection of the batten and left-hand vertical line, beginning with the bottom row and working upwards. ‘Obstructions’, such as sink units, window reveals, and half cuts for the corners and top of the wall, are left until last. If you are tiling the floor, the tile positions are set out with chalk lines, and you start tiling in the middle. Apply the adhesive to the wall or floor, rather than to the tiles, as this is easier and cleaner, and will give a more even surface. Use the spreader or trowel to spread it on the surface to a depth of half inch, covering only about 1 square yard at a time. If you apply more than this, it will dry out before you have tiled it. With the serrated edge of the spreader, drive the adhesive over the surface to form ridges which will give good suction and adhesion to the tile backs. For awkward areas, and part tiles, the backs of the tiles may be ‘buttered’ by spreading the adhesive on to them to a depth 2mm. Press the tiles firmly into place, without sliding them this would merely remove the adhesive from the wall or floor. Any adhesive which squeezes on to the surface of the tiles can be removed later with a damp cloth. Between each application of adhesive, check the horizontal and vertical alignment of the tiles because they are liable to creep. When wall tiles have set, remove the battens and fit tiles into the remaining space, cutting them to fit if necessary. Where possible, remove fixtures such as cupboards; if this is not possible, tile to the sides of the unit, leaving the tiling immediately above them until later. Then fix a batten along the top of the unit so that the top of the batten aligns exactly with the bottom of the tiles on either side. Continue to tile along either side, and above the batten, and when these tiles have set, remove the batten and cut tiles to fit below. A similar method is used for window reveals and doorways. Use round-edge tiles on the reveals of the openings, rather than on the face of the side wall. as this will help keep the vertical lines in true. If the tiles have no spacer lugs, cut small pieces of card and insert them between the tiles. Remove them when the tiles have set. Any part tiles should be nearest the window, with the spacer lugs facing those tiles already in position. Use a felt-tipped pen to mark the tile where it is to be cut. For a straight cut, score the glazed surface with the tile cutter, using a straight-edge as a guide. With the glazed side uppermost, place a matchstick or small piece of wood under and along the scored line, put your thumbs on both corners and apply even pressure downwards. The tile will snap cleanly along the scored line. For a shaped cut, cross scratch the area to be removed and use pincers to nibble away the part, taking small ‘bites’ at a time. Smooth off any unevenness with the carborundum block or file. Near the edge of the tile, a round hole can be made by marking the line round a coin, and scoring it, and the area inside it, with the tile cutter. Nibble away the waste area with pincers. Small holes can be made with a tungsten-tipped drill. Larger holes or patterns can be cut by drilling a series of holes in line to the shape required and removing the section. To make a hole in the centre of a tile, mark its position and then cut the tile in half. Use pincers to nibble away the semi-circle in each half. When the halves are placed together, the join will be barely discernible. When all the tiles are in position, wait at least 12 hours (several days if tiling over old tiles) and then grout the joints. Use a sponge to rub it into the joints with a semi-circular movement. Remove any grout from the surface of the tiles with a damp sponge. When the grout has almost set, draw a round-pointed stick across the joints. Finish by polishing the tiles with a soft dry cloth. First, remove any cupboards that you intend to tile behind. Remove any unwanted screws, hooks, brackets, old pipes or other ‘rubbish’ and, if you have unsightly wiring on the wall surface, cut it back into the wall. If the skirting boards are battered, you may also decide to restore or replace them. Against a bright new surface, any unsightly old items will ‘scream’. The area should be dry, clean, flat and firm. Fill out any cracks and irregularities with cellulose filler or plaster, and rub down to a flat surface when dry. Newly plastered surfaces should be completely dry and, if dusty, brushed down with a wire brush to remove any loose material, If the surface is porous, a sealant primer should be used to prevent absorption of the adhesive into the plaster. If the surface has been previously painted and the paint is sound, you can tile straight on to it (score gloss paint to help adhesion). Otherwise, strip the paint with a sanding block and medium glasspaper. It is possible to tile over old tiles if they are sound and the surface is firm and flat. But well worth considering chipping off the old tiles and their backing mortar, making good the surface and starting afresh. A club hammer and a bolster will make short work of the old tiles, or an electric rotary hammer can be hired to remove a large area. Building boards, such as plywood, chipboard and plasterboard, provide good tiling surfaces, but nust be removed, stiffened and replaced to prevent them from sagging and warping. Appropriate battening of 75mm x 50mm timber at about 304mm centres, horizontally and vertically, will give the necessary rigidity. If the board has a rough side, use this as the surface for the tiles. Use a heavy duty adhesive, and seal the untiled side-an ordinary paint undercoat can be used-to prevent moisture from the adhesive from seeping through. For floor tiles, the surface must be dry and well brushed, and sealed with an anti-dusting agent. Newly laid concrete surfaces must be completely dry-allow a month for each inch of depth. If the floor is solid and uneven, clean it and relevel it. If necessary, remove the surface and re-screed the floor, or use a proprietary self-levelling compound. Timber floors also need to be levelled. This is available in a powder form to which you add water, or ready prepared in cans. Small metal or plastic spreaders are usually supplied by the adhesive manufacture, but if you plan a lot of tiling, a notched trowel will make the work easier. This can be a simple wheel cutter; or a scriber with a tungsten-carbinet tip; or a tile-cutting kit, consisting of a cutting platform, a small try-square and wheel cutter and a cutting tool rather like a pair of pincers. The more elaborate tile cutting machines used by professionals, are also obtainable. These are used to adjust the shape of the tiles and to nip out small sections. Plumb bob or builder’s spirit level. These are used to establish accurate working lines. A lath or batten, the same length as the longest dimension of the area to be tiled. Tiles spacers are measured in millimetres. A 454g quantity, mixed to a fairly stiff paste, will cover an area of about 1.8 sq m of 108mm tiles and 4.1 sq m of 152mm tiles. Other useful items are a radius cutter for making large holes, or a tungsten-tipped drill for small ones, and a carborundum block or rile for shaping and smoothing cut edges. One of the traditional places in which tiles are used is in the kitchens and bathrooms because they are durable and easy to clean. They also help, because they reflect light, to make the kitchen a bright place in which to work. Tiles are available in many plain colours, many of which match equipment in a British standard colour (they have a BS identification number). Floor tiles can be obtained to match or complement them. ‘Effects’ tiles-patterned, textured and sculptured are also obtainable in a wide colour range, but may not always be available ‘off the shelf’ and have to be ordered. Tiles used near cookers should be treated by the manufacturer against heat, or be thick. There are three basic types of tile. The first is the ‘bulk’, or ‘field’, tile. These usually have spacer lugs on the outer edges so that they are separated by a gap from each other. These gaps are filled, after tiling, with a compressible material called grout, which gives a neat patterned effect. To calculate the number of tiles needed, allow three 108mm tiles per row for every 330mm of wall to be tiled, or 72 tiles for every 840 sq mm. Or you could measure the wall and floors , calculate how many square meters needs to be tiled. When you buy tiles for a shop, it should say on the box how many square metres a box will cover. Stainless steel, a very popular surface material for sink-tops, utensils, dishes and tableware, is also available in tiles and can often help to relate the walls to the other surfaces in a kitchen. The other popular material for vulnerable areas of kitchen walls is plastic laminate whorktop sheet. Laminates come in a wide choice of plain, or mottled and marbled colours, woven and geometric patterns, and wood grains. They are made from compressed layers of resin-bonded paper, topped with a layer carrying the printed decoration and a clear melamine coating. It is a very versatile and durable material and can be cut to most shapes. Impact adhesive can be used to fix it to any rigid smooth backing, such as blockboard or chipboard. The edges of the backing material are usually lipped with matching laminate, which is available in strips about 25mm wide in a variety of popular colours. The surface is very hard and tough and will withstand regular cleaning and normal domestic liquids. A cigarette resistant grade is also obtainable. Since laminates can be used for tabletops and worktops as well as for wall facings, it is possible to feature a consistent colour and pattern scheme which will help to give the room a unified appearance.